This flavor reminds you of the classic raspberry, key lime, and orange Rainbow Sherbet. You won't be disappointed with the taste and aroma of this flavor. 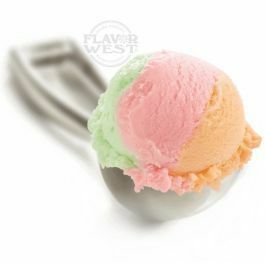 Type: Rainbow sherbet Water Soluble Flavoring. Ingredients: Natural and Artificial Flavoring, Propylene Glycol and Ethanol. USP Kosher Grade Flavoring. Usage Rate: 15-20% for E-use. Flavor Suitability: Suitable for desserts, ice creams, pastries, candy, lip balm and more. Specific Gravity: 1.00 No Refunds on Flavoring.